HomeMD is a patient centered health care service that starts with a simple download of our app. Our revolutionary app opens up the world of healthcare and essentially brings it to your door or device. Don’t waste precious time in the emergency department or medical waiting rooms. Simply download the app and get started. HomeMD has made meaningful, virtual medical consultations possible, which in turn promise quick and accurate diagnoses. Studies have shown that approximately 70% of all ailment queries can be solved easily and promptly via telemedicine, ensuring your time is protected and, more importantly, your health concerns are met. 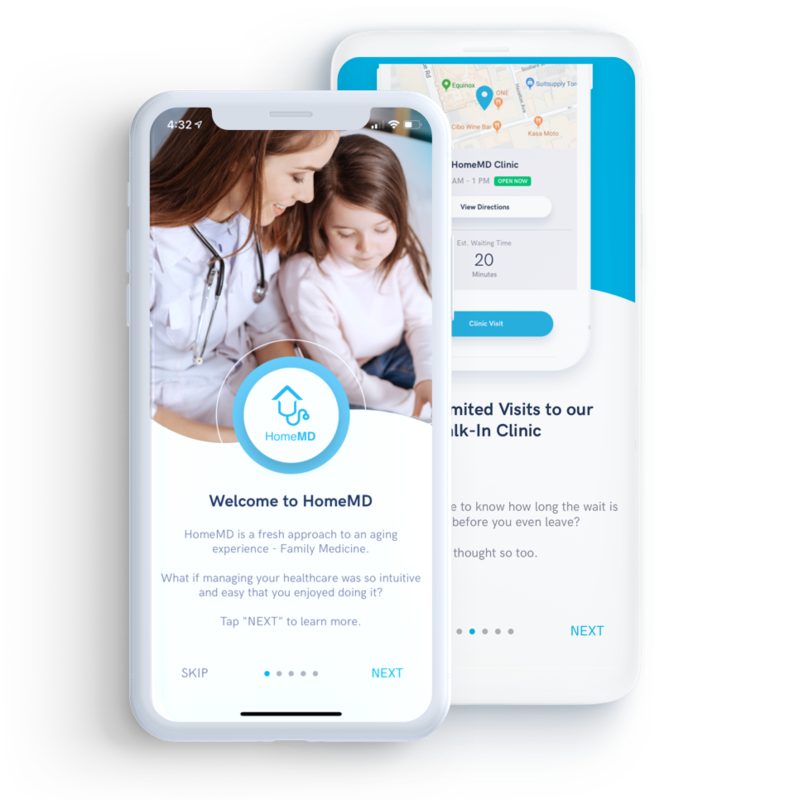 HomeMD is a digital-first, primary health care solution that also offers the additional services of home visits and access to a midtown Toronto state of the art medical clinic. For an affordable monthly subscription fee, you will receive unlimited access to all three platforms. Your health is a priority and at HomeMD we have created a convenient, economical and high-quality alternative to traditional health care that can sometimes be lacking due to shortages and overcrowding. Whether you are a child, teenager, middle-age or senior; have a minor issue or a chronic one, our team at HomeMD can typically make a medical video diagnosis to resolve your health concern. If not, our alternate platforms of home visits or clinic visits can be accessed. We offer all the components that are integral to excellent health care in a setting that is easy to access, high-quality and cost-effective. Knowing your health care provider is a click away provides peace of mind and reassurance that many people simply do not have in the current system. Our easy to use app will not only allow you contact with your primary medical care provider (through video, clinic and home visit access), it also has the added benefit of enabling client access to medical records. Patients want online access to their own health records, including immunization records, medical history and appointment notes, referrals and lab results. For the first time ever, access to all your medical records is just one click away. It’s virtually like having your doctor in your back pocket! In today’s health care climate, it can be challenging to access timely care. Family doctors throughout Ontario, and in Toronto particularly, are overburdened with patients. Getting a simple diagnosis, a prescription or a workplace note can take hours and sometimes several days, or perhaps more. At HomeMD, we are aware of this issue and have found a solution – telehealth. Simply put, Telehealth is the future of medicine. It is used across the country now for many reasons, including consults in remote areas. By video chatting via a secured app from your own home with one of our medical professionals, we have taken telehealth to the next level. Saving you time and effort in getting to an office or even an emergency department, having a medical video consultation will allow for a medical diagnosis and treatment up to 70% of the time. Knowing you have unlimited access to telehealth services, as well as the other platforms, for questions and concerns is a great way to help you take charge of your health. Medicine has changed significantly over the past several decades, and promises to change even more with the advent of telehealth/video consultations and personalized medical service. HomeMD offers all of these services in an all access package of $50 per month that is available to you and your entire family. Nurse practitioners are delivering primary healthcare to approximately 3 million Canadians already. HomeMD has partnered with nurse practitioners, a qualified, caring and extremely knowledgeable group of health care professionals, to staff our telehealth, home visit services and clinic. Anyone who has been looked after by a nurse practitioner will tell you they are not only highly-educated, knowledgeable and accessible, but they are also caring and willing to build solid relationships with patients over the long term. Nurse practitioners have the education and authority to perform most primary care functions, including diagnoses, lab tests, writing prescriptions and many procedures, among other things. Our team recognizes the importance of ongoing care and offers personalized medical advice via telehealth/video consultations as well as other platforms. Once you download our app, you will have unlimited access to a nurse practitioner who can video chat with you to address your health concerns quickly and efficiently. Having a WebMD service at your fingertips will alleviate concerns related to accessing timely, quality healthcare. HomeMD serves the mid-town Toronto area via telehealth, home visits and a professionally-staffed state of the art medical clinic. Welcome to the next evolution of family medicine in Canada. Now serving the mid-town Toronto area, HomeMD features a powerful new app offering a unique platform designed to make your life easier and healthier. Our new software is the next step in patient-centered care. It reflects our goal to design our family practice around you, our patient, and to provide the treatment you need, when and how you need it.For only $50 plus HST per month our app will provide you with the following:– Secure digital access to all your medical records;– Unlimited home visits by our medical professionals;– Unlimited visits to our state of the art medical clinic conveniently located in mid-town Toronto;– Unlimited Video Consultations with our Medical Professionals.